Just recently we realized that we never described how to do this on the site. We’ve had several people ask how to take the trim off the door handle area, so here’s the missing information. 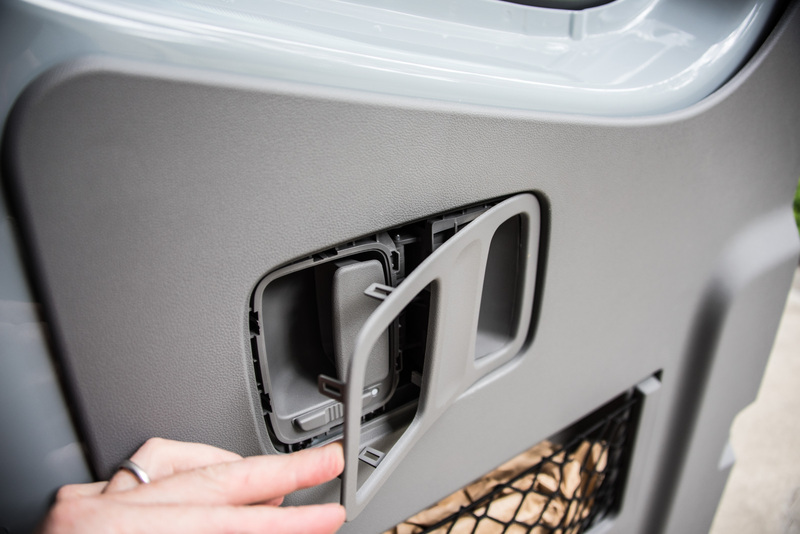 The driver’s side rear door panel just unclips like any other door panel. Slide a trim tool between the plastic panel and the metal door, and unclip the many green clips by twisting the trim tool to apply force right next to them. After you’ve undone a few this way, it might be easier to just pull the whole panel away using brute force. On the passenger side, you have to remove the interior door latch handle trim before you can take the panel off. This piece of trim is a different design to almost every other piece of plastic in the van. It’s thin and easy to break. The tabs on it are flimsy. To remove it, we gently pulled it away from the door using a trim tool, just enough to insert a pick into the gap (a small screwdriver would work too). 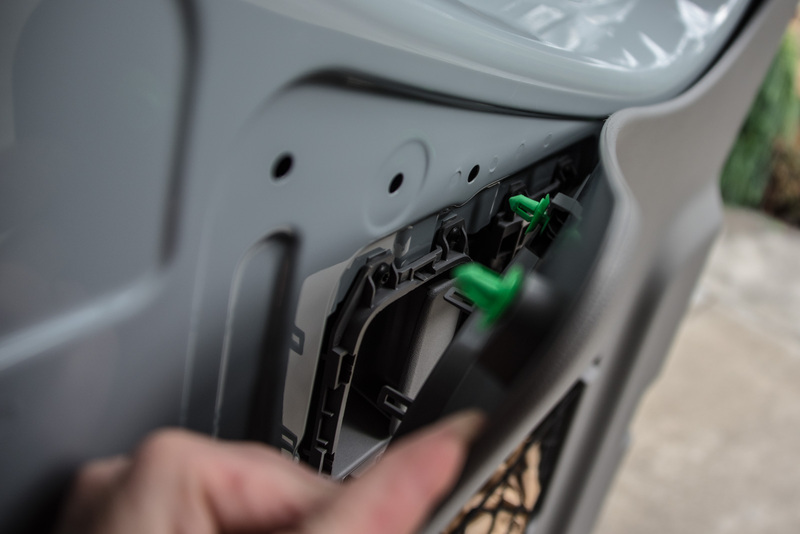 The trick is to pull each tab on the trim piece away from the detent that holds it in place. That means levering it towards the outside edge of the trim piece. You only have to push it a little way for it to unclip. Keep the trim tool wedged in so the tab doesn’t re-seat itself, and then move on to the next tab. After you’ve worked around three or four of them you’ll be able to pull the trim piece away further and more easily reach the other tabs. The trim surrounding the door handle is flimsy, so be careful when you remove it. Be careful, because there are also two tabs attached to the central vertical piece of the trim. If you look in the photo above you can just about make them out. They need to be pushed toward the join between the doors to unclip. This might not be the preferred Mercedes way to remove the trim, but it worked for us. Go gently, take your time to really look for each clip location and free each one up, and you should be fine. Once you’ve removed the trim, the rest of this rear panel is just like the other door panels. Use a trim tool to pry the green clips out from their holes. 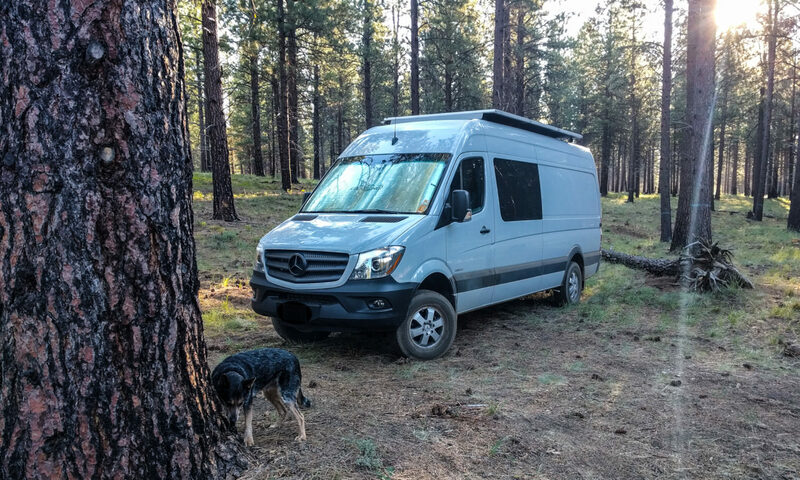 Now you can fill the voids behind the panel with insulation, but remember to leave space for the storage compartment to fit back in. Reinstallation is simple. After you’ve reattached the panel by popping all the green clips back in their holes, just offer the trim piece up to the latch area and push it gently into place. The tabs will re-engage with the detents and hold the whole thing together. what type of storage unit do you suggest for the door void? Milt, our crew van came with storage already built in to the panels in the rear doors. It has mesh over the front of it, and it’s just a perfect size for our first aid kit. 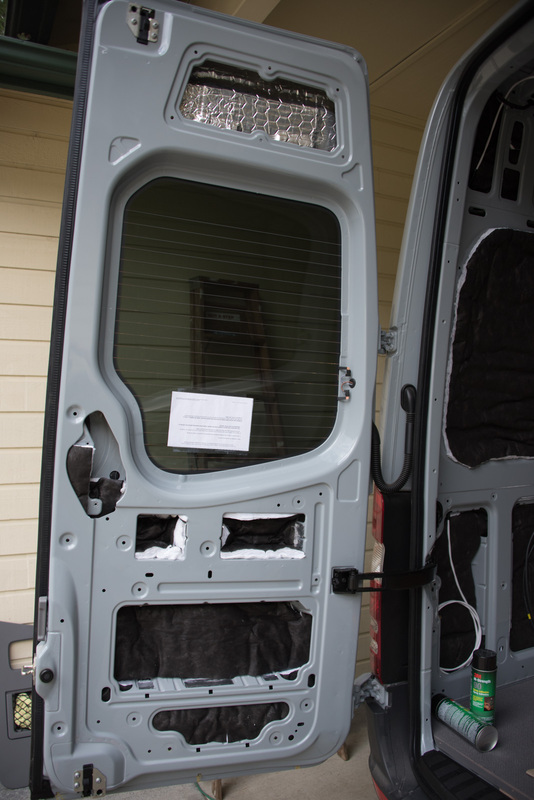 If I was building the panel myself (cargo van, for instance) then I’d probably look at plastic storage tubs to see if I could find one the right size to glue on to the back of the panel, then make a cut-out in the panel. We did make use of the void in the top part of the rear doors. We used metal flight case handles designed for Marshall amps, and mounted LED lights in to them. You can see a picture in this post.